Make your way to a meeting point in central Savannah, where you’ll meet a local guide and board a climate-controlled minibus for a 10am departure. Follow a carefully-chosen route down Savannah’s broad, shady boulevards, passing some of the city’s most elegant antebellum mansions and estates along the way. Start with the core of the Historic District, then move into neighborhoods that are often overlooked by visitors. Explore the Victorian District, where homes are trimmed with colorful stained glass and gingerbread decorations, and see the restoration work that’s revitalized the Thomas Square neighborhood. Learn the fascinating history of the Beech Institute neighborhood, then cruise down Victory Drive, a classic Savannah street lined with towering palm trees. Throughout the tour, the guide will bring Savannah’s culture to life with fun stories and historic facts, sharing an insider’s glimpse of “The Hostess City of the South.” This 3-hour Savannah tour concludes at the original departure point. This tour just circles the trolley tour multiple times. Only tour I was very bored on. Guide was hard to keep interest in. 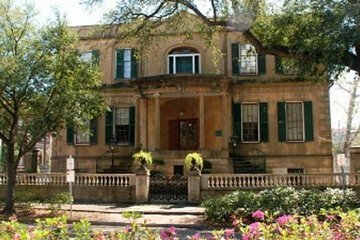 This tour provided an in depth knowledge of the history and architecture of Savannah. Our guide was very experienced and easy to understand. Our tour guide was excellent ver it is often better if the narritor is not also dling the driving, parking and answerig questions. A welcome reprieve from the oppressive heat for sure! Our tour guide was so incredibly knowledgeable, moving seamlessly from subject to subject. We loved it and very much recommend it for anyone wanting to learn more about our history, and do it in comfort! Great tour guide, beautiful places. A truly great tour. Our tour guide Jefferson did an outstanding job and we felt like we went back in time and came to know what the people who populated the city went through. The history of the houses, buildings and neighborhoods was explained in a way that gave one a sense of how the city grew over time. This tour should be a must for those who want to better understand Savannah. This was an excellent tour. Jefferson, our guide gave us a 3 hours tour of the entire historic district. He is a walking/talking encyclopedia of Savannah history. His tour was 5 stars!!!!! I highly recommend this tour but try to ask for Jefferson. Amazing Tour, Very professional and knowledgeable guides. We enjoyed this tour very much. Jefferson was a great tour guide and very knowledgeable. Would recommend this tour. Guide was an encyclopedia of information!